Sidney Slon/Staff Photographer Junior guard Richard Caldwell, Jr. contributed 13 points and three rebounds to help lift the Bearcats over Misericordia for their first win of the season. Powered by a balanced collection of scorers, Binghamton earned its first victory of the season on Tuesday night with a 107-64 home victory over Misericordia University. Freshman guard Sam Sessoms led the Bearcats (1-2) with 50-50 balls across the floor and aggressive drives to the basket. Sessoms finished the night with 18 points on an efficient 7-of-12 shooting, along with five rebounds and four assists. Both teams were tenacious on the floor, as scrappy play on loose balls was seen throughout the game. Misericordia played especially aggressive, fouling 20 times over the course of the match. Sessoms joined with graduate student guard J.C. Show and senior guard Timmy Rose to form a dangerous backcourt throughout the game. Rose, who finished with two points and nine assists, was able to find driving lanes all game long and dish to a big or a kick out to a guard. The Bearcats received contributions from nearly everyone on the roster, with six players reaching double digits in points. With 48 points in the paint, they were able to keep the Misericordia defense on its heels, particularly in the second half when Binghamton scored 26 points in the paint. Sophomore guard Tyler Stewart, who had been injured for the first two games, played for 12 minutes on Tuesday night. Although he had limited minutes, Stewart looked promising with two three-pointers and six rebounds. Collectively, BU was able to consistently get good looks thanks to its quick ball movement. With 21 assists and steady shooting, the Bearcats maintained a 54 percent mark from deep and 58 percent overall. Show was lethal, as all 12 of his points came on a 4-of-7 shooting performance from behind the arc. All double-digit scorers for the Bearcats were able to maintain at least 50 percent shooting from the field. 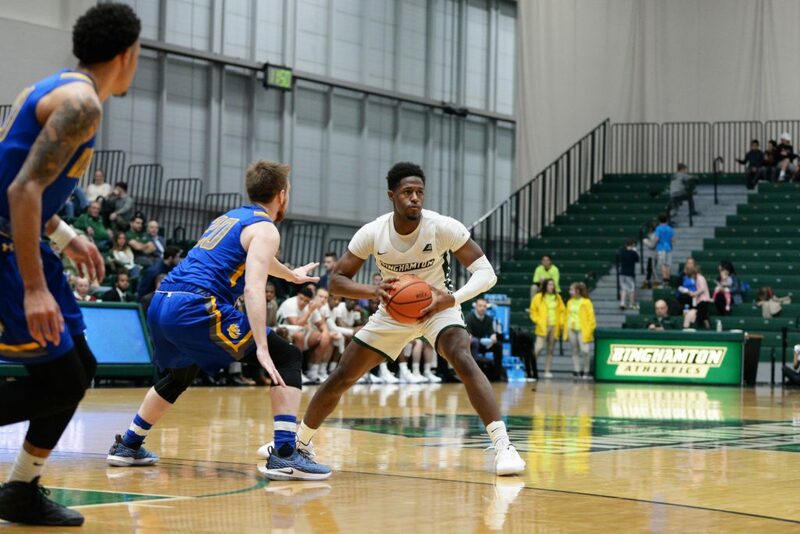 On the defensive end, Binghamton fluctuated between a man-to-man defense and a two-three zone. The alternation threw Misericordia off in the second half, as it shot a subpar 24 percent field goal percentage in the game’s final 20 minutes. The zone defense allowed Dempsey’s squad to get out in transition and score in unsettled situations. Tuesday’s win was a relatively promising showcase of what the team is capable of, despite the fact that Misericordia is a Division III college. Following Tuesday’s victory, the Binghamton athletics department announced that Dempsey was given a two-year contract extension. The move dispelled any concern that Dempsey’s job was on the line this season, and the team can continue its progress this season without the looming threat of uncertainty at the head coaching position. The Bearcats look to notch a second consecutive win against Northwestern University on Friday at 7 p.m. at the Welsh-Ryan Arena in Evanston, Illinois. The game will be broadcasted on ESPN News and will be called by ESPN’s “Pardon the Interruption” cast, Binghamton alumnus Tony Kornheiser, ‘70, and former Wildcat Michael Wilbon.